I see Sidepodcast dot com are running a series entitled Days That shook The F1 World - and the second article, posted yesterday, is about the death of Ayrton Senna. It was a terrible day for the sport, an event that shocked all F1 fans and, for weeks afterwards, my mind refused to accept that he had truly gone. He was so much the representative of all that was good about motor racing that, well before the end of his career, he was regarded almost universally as a contender for the title of "the greatest of them all". The strange thing is that I was in the anti-Senna camp when he first entered F1. There was a feeling, probably similar to our present irritation with the hype surrounding Lewis Hamilton, that nobody could be that good and who was this upstart anyway? His confident statements came across as arrogance and most of the drivers of the time were of the opinion that he needed to be taken down a peg or two. I agreed, at the time. 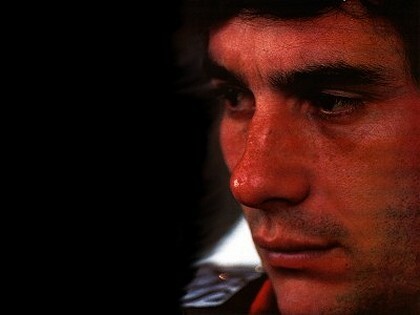 Ayrton won me over against all my previous doubts and biases. Normally, I notice a driver very early on and follow his progress enthusiastically, usually because of a particular performance that stands out. I was sold on Keke Rosberg, for instance, by his win in the downpour-affected 1978 BRDC International Trophy - in a Theodore, no less, and against all the big names. Nelson Piquet earned my support by thrashing the over-estimated Niki Lauda when they were team mates at Brabham - and eventually causing the champion to walk off into his first retirement from the sport. And Jean Alesi gained thousands of fans when he hauled the uncompetitive Tyrrell past Senna's McLaren at the Phoenix GP in 1990. It was Piquet who made it so difficult for me to accept the genius of Ayrton Senna. There was no love lost between the two, Piquet once describing Senna as "that Sao Paulo taxi driver", and it was hard to see the fastest Brazilian to date being beaten by his young compatriot. But beaten he was and, eventually, I had to admit it. Ayrton was just too good to ignore. There are few who would argue against Senna being the quickest driver of his time but there was more to him than that. There was an aura of certainty about him, a clear view of his own abilities and an understanding that there was more to life than just motor racing. On the track, he was superb, winning races with an ease that seemed superhuman. Many of his race wins were in cars that were not the best and this is where he differs from so many recent champions. Prost, for instance, could win in the best car but he could also lose in it; Senna would fight his way to the front in almost anything. In time, I came to see Ayrton as probably the best F1 driver ever. His achievements, although not as statistically impressive as Michael Schumacher's, were gained against serious opposition, often a team mate in an equal car. He brought techniques to F1 driving that the rest have had to learn and he died long, long before we were ready to see an end of his awe-inspiring skill. In our minds, he had become immortal and his sudden demise was the greater shock because of it. It may well be true that those whom the gods love die young - it is the only explanation that makes any sense when we consider how Ayrton was taken from us. The memory of that Sunday afternoon when it became clear that the great man had departed is still hard for me to understand. I suppose I have accepted his death now, but it was a long and bitter time before I could face it. F1 lost some of its glory that day, a day that shook the world indeed. "It may well be true that those whom the gods love die young - it is the only explanation that makes any sense when we consider how Ayrton was taken from us"
I was not an F1 fan at the time of his death, but I do remember hearing my father talk about it ( I was 9 at the time , how does that make you feel Clive & #38). I think what makes it so much worse than some of the other deaths in sports in the uncensored footage of him being extracted. It sickens me to watch now, what could have been done.... what should have happened. I'm sure you could write another 4 posts on what should and shouldn't of happened on that weekend. In retrospect it all seems so easy to avoid. I think that is what makes it that much harder to accept. What if he survived that crash and finished his career a shadow of his former self. Sure his legacy wouldn't be the same that it is today, but he would still be a great person, nothing can take that away. I think he may well have been dead even before the marshals got to the car, Dan. It was a freak accident, the front wheel coming back at him like that (and the reason the tires are tethered now) and I'm not surprised that it hadn't been foreseen. Personally, I don't watch the videos of the crash - I can picture it all too vividly as it is. Perhaps the only consolation is that we will always remember him at the height of his powers and he will never grow old and feeble. I never watch videos of accidents. I saw Tom Pryce's accident in the middle of a youtube vid recently. That was horrible. The thing that annoys me about Senna's accident was that it was entirely predictable and the FIA and Max who were responsible for it have had nothing but praise for the safety work they have done since. Imagine for a second you are president of the FIA at that time and there have been 6 years since deAngelis died in testing and 12 years since Villeneuve and Paletti died at race meetings. Everyone believes the sport is safe because we have seen countless horrendous accidents which people have either walked away from or have at least survived. Then Imola happens. What are you as the head of the FIA going to do? Is it in any way possible you are not going to make a big thing about safety? The days when people are prepared to accept people dying on TV are over. If you want to keep the job safety has to be seen to be you priority. Piquet hit that same wall at Tamburello some years before. At that point the FIA should have been jumping up and down telling Imola that we can't have cars hitting an unprotected wall. I know there is a river behind the wall and it couldn't be moved back but the circuit could have been re-routed or tyres could have been put in front of that. Had that been done Senna would have lived. There used to be a phrased that journalists used about safety in F1. The problem won't be solved until someone dies. At least that seems to have gone now. After Piquet's accident the FIA got a second warning. Gerhard Berger's Ferrari hit the wall and erupted in flames live on TV in front of millions of viewers. Berger sat in the car motionless and burning for 30 seconds before a marshall turned up. Imagine 30 seconds of live TV of a driver sitting motionless in a burning car. Imagine how many people are watching that live on TV. If you were the president of the FIA at that time watching a driver you think is probably dead (because we all did) what would have been the first thing you would have done the next morning? For me it would have been to tell Imola, Bernie and anyone else who was interested that there would never be another race, test or demonstration of any racing car (not just F1) until action had been to make sure no-one else ever had to hit that wall. Then the hand-wringing started and safety became a priority and Max has been collecting plaudits ever since. Williams got dragged through the courts. The FIA and the circuit owner/operator who watched Piquet hit that wall, who watched Berger hit it and burn live on TV were never charged with anything. Of course the problem was fixed 'after someone had died'. I am not religious. I believe Senna, like deAngelis, like Greg Moore was killed by the neglect of the people responsible for his safety. I was referring to the accident the previous day, that had they followed the law in Italy the race would have never happened. Roland Ratzenberger died on the track, that should have led to a criminal investigation to be completed before any event can take place (per Italian law). This would have pushed the race back at the least. I believe they stated that he died in the helicopter but this is a little hard to believe. I believe there is also a controversy that they revived Senna even though he had no chance of survival so they could continue the race without the police getting involved. Ayrton also stated his fears about racing after his friend had died. What bothers me most about this incident is that the race was allowed to continue. Whilst I agree with you both that Senna's accident need never have happened, the awful truth is that it did and we have lost a great man as a result. It is a shame that things became obscured by vested interests and accusations after the event - all directed at the wrong people, of course - but nothing can bring the man back. And I miss him. "here used to be a phrased that journalists used about safety in F1. The problem won't be solved until someone dies. At least that seems to have gone now." Thats what scares me, the sport will never be 'safe' but if it takes someone dying to peruse safety then we are doomed to repeat history. The freak accidents, like Alex Wurz's near miss with David Coulthard in the Australian GP this year, will always be with us. We cannot foresee everything. But it's when a problem has been evident for years and yet nothing done about it that we are entitled to become annoyed. As Steven has pointed out, Senna's death was avoidable. Unfortunately, no amount of recriminations can ever stop the pain of it. As I have said so many times safety is spelled "$AFTY". Here is the USA we have the FAA who controls safety for the airlines. The term they have for what we are discribing is "tombstone technology". This is to say that until some one DIES it is not broken. Look at NASCAR-- it took the death of Dale Sr. for the safer walls and the adoption of the HANS device. I have to say that as far as Senna is concerned this was the only way for him to leave the sport. I enjoyed watching him and I miss his driving skills, but I will always remember him at the top of his game. He has that same feeling for me as Dale Sr. both had only one way to leave the sport--sad-- but to me true. I'm not a big supporter of viewing anything remotely historic by current standards but, yeah, Berger's accident should have set off some changes to Tamburello. Even at the time there was some grumbling. If they'd addressed it then, who knows, maybe they'd have managed to get some trees felled, Senna might still be alive and Tamburello might still be one of the great corners instead of a shabby chicane. But, everyone pretty much knew that real safety wasn't going to be a major issue until someone important died. If it had been any other driver I'm not sure there would be such a push on safety until much later. I've only watched one of the videos once since it happened. e I missed seeing the shots from Michael's on board because they showed it during the red flag and I just had to walk away after they got Senna out of the car. I've always believed he died at the track because from the shot we got of them loading him in the chopper it was pretty obvious he wasn't on a back board and no iv's in sight. I 've heard the European television feed was more graphic than what we got in the US. The driver I loved to hate and hated to love, mostly because I was a Prost fan. I still believe Schumacher had him rattled that season and even grinned a little about it, but I've always wondered if maybe he were a little less challenged things might have been different but, probably not. "the Sao Paolo taxi driver" I'd forgotten about that! Too funny! There is much truth in what you say, John, and it goes to the heart of the saying that those whom the gods love die young. I wrote much the same thing in a post on my personal blog, Gone Away. You are so right about "any other driver", Verasaki. It is perhaps only because of Senna's death a day later that Roland Ratzenberger's death is remembered. And I think it's true, too, that Senna was a bit pressured by Michael's speed that year. He had gone to Williams expecting to be in the best car after years of having to struggle in an uncompetitive McLaren, only to find that Benetton had suddenly produced the best car in the field. In the previous two races he had been able to keep up though driving on the ragged edge and it is said that he insisted on the modification to the steering that may well have been the cause of his accident - all in the drive to find that little bit more speed to make his task a bit easier. Versaki is right that had it only been Ratzenberger who died then nothing much would have changed. When Elio deAngelis died in testing nothing much changed other than improvements to marshalling during testing. Like the subsequent changes to Tamburello it should have been reasonably obvious by the mid 80s that a couple of guys in shorts with one hand held fire extinguisher were not really going to be able to cope in the event of a big accident. The fact is Elio died without having a significant injury despite the car flying off the track and landing upside down in a spectator area is disgraceful. The fact that Barrichello had a huge accident on the Friday then two fatalities on Saturday and Sunday then Wendlinger's accident at the next race meant that safety had to become important. There was no way however Tamburello could stay the same afterwards. The wall has a river running behind it so it cannot be moved back. Trees don't figure in this equation. Generally they have been more a problem at Monza over the years because it is a royal park and its trees are sacred or something. Berger has spoken at length of how he tried to get Tamburello sorted after his crash and his regret that his acceptance that the wall couldn't be moved resulted in the death of his great friend. While I can understand why he accepted the explanation I cannot understand what kind of moron came up with it. It had to be either someone from the circuit or the FIA and given Italy's love of dragging motor racing people through the courts every time there is a major accident on their soil whoever said it was leaving themself wide open to legal trouble. The interesting thing is that similar walls still exist, unprotected by tyre barriers, on other tracks. The Montreal circuit has the wall that Kubica bounced off this year, for instance - again on the outside of a fast corner. Are we sure that we have learned the lessons of the past? The cars will be improved each year but the one thing that can't be strengthened is the squishy bit that fits between the steering wheel and the seat. Formula One has been quite lucky to have maintained such strong driver safety record since 1994, so hopefully that does not lead to complacency. Even Hamilton's qualifying stack at the Nurburgring was a close call. He wasn't far of vaulting over the tyres and into the bushes. In my (biased) eyes Senna was the best driver of all time. Clark, Prost, and Schumacher may have been more ‘complete’ drivers but I don’t believe anyone could extract more speed out of a car than Ayrton. My favourite Senna story was the Penske Indycar test he took part in during 1993. Within 25 laps in an unfamiliar car, on an unfamiliar track, he beat Emerson Fittipaldi’s best time. Not bad at all. Loads of interesting thoughts here. I remember the day very well and everyone seemed affected by it as, only having the 4 channels back then, it seemed loads of people watched it and it seemed to affect more people. I also remember the pictures of Senna being taken out and, looking back, it was harrowing to watch when we didn't know how he was. One thing is for sure, F1 missed Senna for several years after his death. His departure left an obvious void in the sport and a truly great driver and, by all accounts, a great man were never to be seen on the circuit again. I loved watching him - other top sportsmen remind me of Senna nowadays. The likes of Tiger Woods or Roger Federer were like him. Totally at ease and on top of their game when they dominate their sport, just like Senna did. RIP. I believe he was the greatest of all time, certainly the best I have ever seen. We hear stories of Nuvolari, Fangio, Clark, but nothing can compete with the sight of Senna in full flow in the car, making it look easy as he forces his way past one car after another. Very occasionally, I see flashes of the same brilliance in other drivers and am moved to say, "It is as if Senna was in the car", but only he could drive like that for an entire race distance, sweeping through the corners on the absolute limit yet never producing those little twitches that speak of overdoing it ever so slightly. Clive's comments on Montreal show exactly why I get annoyed about Max getting so much credit for his safety work. Apart from anything else we are still racing at Monaco. That is insanely dangerous. I would love to see a professional risk assessment that could justify continuing. But we will continue 'until someone dies'. We have all seen accidents where a car contacts another and flies over it. Imagine a car going into a spectator area at Monaco. A wheel from Jacques Villeneuve's car killed a marshal at Melbourne a few years ago when it went through a gap in a fence. The same thing happening at Monaco could result in a stack of deaths. The Coulthard / Wurz incident has happened numerous times over the years and been ignored each time. I refuse to believe that it is impossible to build a structure to protect the driver's head while still giving him a good view. So much effort in the 80s went in to moving the driver's feet behind the front axle line and creating crash structures. Where is the sense in giving more protection to a driver's feet than his head. Then there is the matter of driving standards. Take the case of M. Schumacher esq. He deliberately drove into Damon Hill to win a world championship. He deliberately drove into Jacques Villeneuve to try to win a championship. And no punishment was given in either case. I do not consider taking his second place in the championship away as punishment. Senna had a championship taken off him for short-cutting a chicane after Prost crashed into him. Schumacher put Alonso off the road on the Hanger straight at Silverstone at close to 200mph and he tried to put Hakkinen off the road at similar speeds at Spa. There are numerous other incidents involving Schumacher and other drivers but each of the 4 described should have resulted in a ban and in each case no meaningful action was taken. He did however get banned for ignoring the black flag which he received for the heinous crime of overtaking Damon Hill on the warm up lap at Silverstone and for his plank being a bit thin at Spa. Never mind 'once someone dies' as a result of the appalling driving standards acceptable today something will be done about it. And 'once some dies' as a result of a car hitting a driver's head something will be done about that. And 'once someone dies' at Monaco we won't go there any more. Of course if a car went into the crowd at Monaco we are not talking about some 'one' dying we are pobably talking about an accident on the scale of the 1955 Le Mans disaster. Still the publicity will no doubt help Bernie's bank balance. Oh and in this age of safety as a top priority this season we are going to race in the middle of the night at a circuit which has no experience of running any kind of racing. The FIA's attitude to this venture shows how seriously they take safety. They have run some tests on the lighting to make sure it is OK for the drivers and for TV. It doesn't seem to occur to them that the marshalls are going to have to switch to night shift mode after finishing their normal working week. I spent 3 years working rotating shifts and after a while you adapt to it but even so working through the night you are not at your most alert and most people experience a two hour spell where they are way, way below par. The first few weeks are horrendous as you are completely disoriented. But apparently OK to supervise a GP weekend. And not just any weekend but the first international race any of them have experienced. Then there is the issue of people getting to and from the circuit in safety. I can't imagine that has troubled Max and Bernie too much. The whole venture is insane and only motivated by the over-riding factor in F1. It will improve Bernie's bank balance. Agreed on every point, Steven. Which leaves me little to say except, "How long will it be before we get the revamp F1 needs most - a complete restructuring of the FIA?"